We live in a world obsessed (!!) with immediate gratification. We want it all and we want it now. Ever have to wait a full 5 minutes for your Starbucks Frappuccino? You’ve texted 3 people to complain about the wait during those 5 minutes, right? Or you rolled your eyes, tapped your fingernails on the counter or sighed really loudly. People lose their minds because they have to wait for something. Good things require insane amounts of work and effort, time and dedication. Nothing good comes immediately. With all this immediacy we’ve forgotten the value of long-term goals and how they don’t usually pay off for a while. 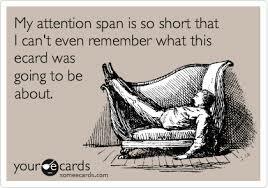 Do you know that our attention span has declined down to 8 seconds? The average person doesn’t read entire articles anymore, they just scan headlines…..hence why so many people have an incomplete understanding of vital issues that affect their lives. Decreased attention spans are attributable to the barrage of external stimulation we’re under. You need to be very selective in what you’re exposing yourself to so that you always remain on task, on schedule and working towards your dream, and not someone else’s. Short attention spans = inability to see the bigger picture. It leads to impatience and even poor reading skills. What you do today and tomorrow and the next month matters. You may not see the immediate benefit for a while, but that doesn’t mean you should stop. You’re really only as good as your last day. Keep working, keeping putting in insane amounts of effort. It will pay off, because most people are not willing to keep up the pace for extended periods of time. You’ll smoke the competition, if you just keep your long-term vision in sight. You’ll be achieving success, while others are checking their email for the 30th time that day, or posting mindless updates on FB. Remember, it’s all about delaying that immediate gratification (i.e. checking your phone, again), in order to remain on task and keep working on that long-term vision. Previous reading3 new video’s posted. Next reading Be compulsive, be unreasonable.